The Honda CBR125R was updated for the 2011 but it is only a cosmetic update to keep it in line with the all new and just released all new CBR250R also released in the same year. It is also unlikely for it change for another few years. From pictures you could easily confuse the two models which is probably the intentional. Both version are targeted at learner riders and commuters who want a good looking and reliable transport. The engine is a single cylinder model that produces decent power and the quality of manufacture is very good too. Overall it is easily better built than Korean or Chinese manufacturers of the same engine capacity. In terms on specification comparison the CBR125R is up there with the best in class and adds racing pedigree. 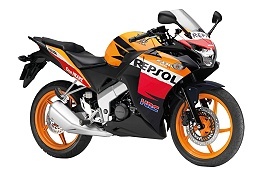 If you are considering the CBR125R maybe you should also consider the CBR250R? After all there isn’t much of a price difference except when there are specials on!